so wich kind of pulley ? I thought i got a 20 teeth, i need a 36 one ? If I print the new support, i need to print motor and bearing support or just bearig support ? About switches, are the new position already into jscad software ? BTW, you sell the pulley ??? pvt me ! The one RcJoseb is using looks like it gives good clearance. Looking at the bearing supports, can you try and see if you can switch the parts around? Like the right to the left and the left to the right? I don't know if there would be enough space to to that, but if there is, this will move the bearings out more to give clearance. Maybe this picture might explain it better. For what i know, the bearings ARE 608ZZ (as listed on ebay auction ); Not sure 100% for the pulley, i had to ask. About the center, well i think that maybe there is an error into jscad file ? I have used the 1.0.1 version with 8 mm rod for x & y and 17 mm for wood thickness and 10 mm for Z axis. Can someone confirm that with those parameter the generated piece plate are ok ? I mean all the center look ok, but the other distance ? Or, someone have already made a printer with 8 mm x-y rod ? For the pulley, mark one tooth (ridge) with a marker then count all if them. It shoudl be a total of 20 teeth (ridges). It's simple to check for the bearing mount. Start at a point close to the motor and measure the distance from the edge of the rod to the inside wall of the box. Then repeat the measurement closest to the bearing mount. They shoould be the same. If the rear is closer to the inside wall of the box, then adjust the rear bearing mount towards the center of the box and visa versa if it's farther away at the bearing mount. Do the same for the other side. This ensures the rods are parallel. After a full dismount of the printer, i started re-build agin. I use the motor support, with a little piece of steel rod to fix at the correct position the bearing holder. In this way i'm sure that the distance betwen the motor support and bearing support are correct. Also rebuild the whole x carriage. This time the belt aren't touching, and all look move smoothly. I will test motor and connection soon. I use Marlin. Very happy with it but I haven't tried anything else. I am reasonably happy with arduino code, which might make it seem easier to use to me, but I wouldn't say you need any arduino experience to use marlin. There's a good selection of guides on the Web. This time the questions are two and the stop will be longer. Yesterday i burn the MEGA and i'm looking to buy a new one. I try to repair (look like the voltage regulator was burn so change with a 7805) and works partially: it run and drive motor butisn't possible to connect with REPETIER nor programming again. - where put the dimension into MARLIN soft ? I project the print volume for 250x250x250. Where put this value ? - As i use that dimension into jscad soft, i buy a 270x270 piece of wood to use as table and a piece of glass about 250x250. When i issue the home command, both extrusor and proxymity sensor goes out of the table. This make the Z axis NEVER go home as the proxymity sensor can't sense the table. I must buy a bigger table or is software issue ? While wait for the postman give me a new mega, thanks for your help ! The metal is just alluminium sheet, the one u use into kitchen (yes, the sensor detect it). HOpe is more clear what I mean. Edited 3 time(s). Last edit at 06/08/2015 03:44PM by Zlob. For the difference between the 0,0,0 coordinates and the heated bed corner, I set this up in the printer settings in repetier host. I use G28 and G29 custom gcode at the start of a print (home all axes and autolevel). Edited 1 time(s). Last edit at 06/08/2015 04:15PM by smerrett79. The new Arduino mega is here and I restart working on the printer. I still have an electronic issue woth proxymity sensor, but i can manage it (using 7805 send just 1,5V to signal pin). The "big" trouble is the software. I try the MARLIN one, got from github and modified just for the display BUT having trouble. I try the REPETIER one, configured as rcjoseb share into the "SmartRapCore dual Z axis with 2 motors issue" pos but having trouble too. - MARLIN need the motor reverse or goes to the wrong angle: i have the old switch setting so home is left-front, but the soft push the printer head to back-right! - REPETIER correctly home the X and Y axis but Z can't never homed as the sensor is out of table (look the picture above). Also i have really slow speed onto homing, expecially on Z. Can someone point me to a correct software version (or send me the config.h file) for a smartrap core with a printable area of 250x250x250 ? Can you please post a close-up picture of the X/Y motor mounts ? I am building one with 8mm rods aswell. It looks like the smooth rod holders are too thin at the bottom. Are they tight enough? Edited 1 time(s). Last edit at 06/16/2015 09:16AM by s0me. My motor mount are tight enought. The only little trouble i had was about the wood thickness. I bought 16mm MDF, but i must say to JSCAD that i had 17mm wall otherwise i can't fit the motor mount into wood. Now I'm *still* stuck with firmware. With the smartrap core original i must invert all the motor connection but still can't get nothing good. With RCJoseb repetier flawour firmware, i can get it moving, and somehow print (completely wrong, anyway!). Look like measurement are all wrong. 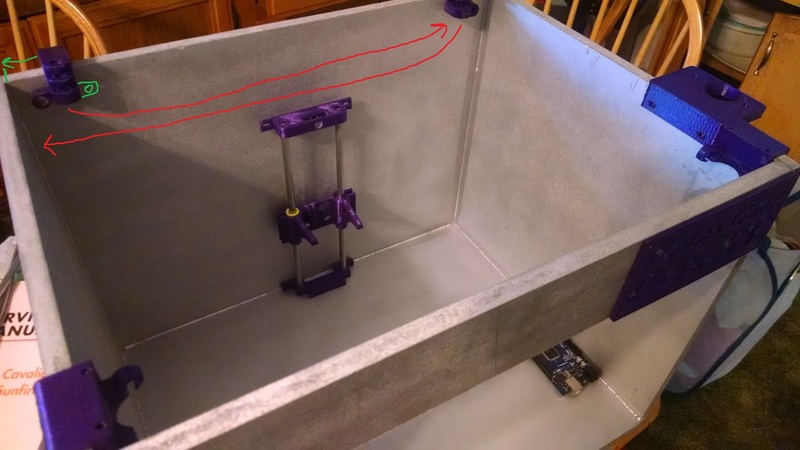 The worst issue is still the Z axis: today i discovered that my plate is too thin so i must add something to get plate more thick otherwise the hotend will be too far from plate (the motor try to raise the plate but belt skip as the plate is at his mechanical top). Still having the X0 Y0 issue: if i home the xy axis, the proxymity sensor can't get engaged by plate as the plate is shorter; same as I issue a G29 command to autolevel the Z axs: if i start into xy home position can't zeroes. Also today i discovered that my print volume is really bigger than i want: i put 250 for XYZ into JSCAD but the effective travel lenght for X and Y are around 400 mm !!! News: the movement aren't correct. I draw a square 100*100*100 with sketchup and try to print. No matter what i change into repetier software, it comes 50*50. Look like the printer divide the size by 2 as default. I try to put 80 (standard), 40 and 20 step*mm but no change. Need a coffe and a break. Edited 2 time(s). Last edit at 06/15/2015 10:00AM by Zlob. 2. The type of inductive sensor, is it an NPN NO? 3. Type of endstops, mechanical or electronic. The electronic ones have a little circuit board attached to them. I will assume you are using a RAMPS V1.3/V1.4, an epcos 100k thermistor and non xbox power supply. Edited 1 time(s). Last edit at 06/15/2015 10:47AM by rcjoseb. Which stepper drivers are you using? 4988 or 8825? microstep settings in firmware vs jumper settings on board? @madmike8: have a RAMPS 1.4 board with 4988 driver, all jumper are onto RAMPS, so I assume that i'm using 16 microstep. I have already the 8825 driver, but they are still untouched into theirs bags. The print area on wich i build the printer is 250x250x250 millimeters. The endstops ARE mechanicals, Normally Closed (external point connected to Signal and ground pins on RAMPS). Belt is GT2 and pulley are 20T. HotEnd is an JHEAD with NTC, no idea wich is, i guess the one u say, at least it works (heat up and temperature is show). I will use your config to see if it works and look what and where u change something !!! Edited 1 time(s). Last edit at 06/15/2015 01:17PM by Zlob. Here is the configuration.h You will want to watch out for a couple of settings and check them. To make it eadier, I have made them BOLD and ITALIC. // This is a customized version of the Configuration.h file for the SmartRapCore. // Customized by Jose a.k.a. RCJOSEB on 6/9/2015. // The inductive sensor used is an NPN NO which when triggers produces 0 volts. // When triggered, the status in Pronterface will still indicate open. Uploading the new config dosn't change almost anything. I try to measure waht the printer do and ... well, if i issue a G1 X50 command, the X axis move for 25 mm. So, i try to double the step value to 160 instead 80. And the printer move correctly. Now i'm investigating where I made mistake: driver are 4988, setting are for 1/16, motor are labelled for 1,8°/step ... Wich one is the liar ??? Edited 1 time(s). Last edit at 06/15/2015 04:41PM by Zlob. Are you sure your stepper motors are 400 steps per revolution? The ones I use are and I set the steppers to 1/8 microsteppping for more torque. @dkulinski: i'm not sure at all. I'm checking all the stuff to find the mistake. The pulley are 20T for sure, as i generate it with a thingiverse generator and printed them. Again, i have count the teeth and they are 20. Driver are 4988 for sure: i read (with a big lens !) the value directly from the chip. Ramps and Mega are ok, the software is now the repetier one as ican change on the fly some eeprom settings (eg. 80->160). The motors are listed as 1,8°/step. I wrote to the seller and they told me that into euro-warehouse they don't have ANY 0,9°/step. In a while i go to measure the pitch of the GT2 belt. Maybe the trik is there. Any suggestion to how check if motor is a 1,8°/step or a 0,9°/step one ? On the first answer Mr. Repetier say that on corexy u must multiply *2 the calculated step*mm. The effective print volume isn't as expected. I put 250x250x250 into jscad generator expecting an effective volume of 250x250x250, but the effective volume is around 210x210x(NOT TESTED). That's an important issue as i need the volume i project and the only way to get it is REBUILD the box and buy new rod. Edited 1 time(s). Last edit at 06/16/2015 07:25AM by Zlob. that's strange with the build volume ? Normally, if you enter 250x250x250 in the print size, you will go for 315 mm X rod size, for example and that should give you around 250mm printable on X ( with a 250 wide plate of course ). I will check again though.. I attach a picture to show. I have checked the print volume and is around 220x220x but you really go near to mech limit. edit: sorry, i forgot to mention that I use the ycarriage and head from version 1.2 old style endstops. Maybe the original head is smaller ? Edited 3 time(s). Last edit at 06/17/2015 08:08AM by Zlob. Another silly question: the proxy sensor must be lower than hotend or upper ? In both case any suggestion about how mm ? Any suggestion on how instruct the firmware to use autolevel bed ? I'm still surprised that no one got same trouble as me ..."
OMG!!!! Jerry and I were just discussing this this weekend on the facebook group. I have the same exact issue with Repetier and so did Jerry. With Marlin, the print bed size in mm where the hot end can actually print is 260 X 270 but in Repetier it's 411 x 411. I too have DRV8825 steppers with 1.8 degree motors and stepping set to 1/16. Jerry said he had the same issue and was able to resolve it by re-flashing/setting the firmware a couple of times. It did not work for me whatever I did. Thanks for the answer to the problem, Ziob!!!!! Tom has a great video on auto bed leveling but some of the things he says are a little confusing. I found this great article on instructables and that is what I am going to follow. The sensor, according to the article, should be about 4mm above the tip of the hot end but that depends on how well your sensor can pickup metal. I switched from using aluminum flashing to a galvanized steel sheet and the sensor can now sense much better. With the aluminum flashing, the sensor had to get really, really close. I have the galvanized steel sheet, which is about 2/16 thin, glued to a piece of luan so that it's supported. To print, I am using painter's tape on the metal. I plan on placing a sheet of PEI on the metal so I can eliminate the tape altogether. I purhased the galvanized steel plate at home depot but I am sure you can find it at your local hardware store where you are. This is very important. The galvanized steel sheet must be magnetic. That's what triggers the sensor better than just plain metal. I mean, once you *manually* level your bed once, there is really no reason for it to become non-level. Why have an auto-leveling process which tries to correct your non-level bed when you could just level it once and be done with it? Also, with auto-leveling enabled, your Z motor(s) will be constantly working throughout the print adding even more variables to the final print quality (e.g. backlash, microsteps accuracy, etc). Well, i think you are partially right. If u have a threth rod for z level, a full metal Z axis and sledge when u level the bed it still remain level. But all meatl stuff is really expensive. In my case, Z axis is full PLA, sledge is full PLA too and no thread rod but GT2 belt. To the opposite side of Zaxis, bed will force down and go out of level. I do some test but still have the bed moving. Today i bought a bigger bed (the first attemp was 270x270, this one is 320x330 and 0,8 thick wood) and hope it will be more stable. Anyway, I think using the autolevel is a good idea for this kind of setup. After lot of test, with lot maerials i really need help with Z axis. Today i reprint the z axis, and use the V 1.2 . Still having some trouble: as i use 10 mm rod the sledge touch a little backward. But the worst thing is which kind of plate i must use. other wood+heated bed+glass and so on. I have bought a 250x250 4mm thick wood but is a little shorter to 0 position.